Imagine a drier and warmer Southwest, a region in which heat waves, droughts and, paradoxically, floods become increasingly frequent, and snow cover dwindles. These projections, made by the world’s leading climate scientists, suggest that climate change will hit the Southwest harder and sooner than some other areas of the country if global warming continues unchecked. In the face of such a dire scenario, how can the average citizen possibly help? Certainly not everybody can afford to put solar panels on their roofs to reduce their contribution to global warming, but there are many ways individuals and businesses can reduce their impacts on climate. Purchasing carbon offsets from various groups, planting trees, driving less, adjusting the thermostat, and other individual efforts collectively add up to valuable cuts in the emissions that contribute to global warming. For about $20 a month, the average American can eliminate greenhouse gas emissions, according to the Cool It! 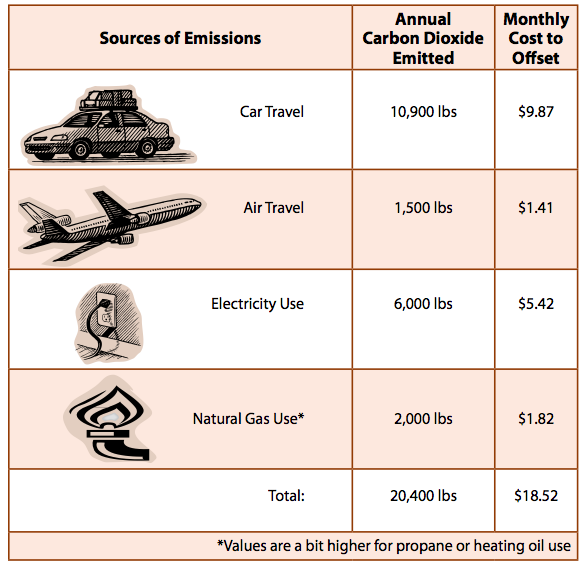 campaign, a carbon offset project run by a coalition of four groups (Table 1). It sounds almost too good to be true, considering all of the problems associated with rising industrial greenhouse gas emissions and their role in global warming. Society’s current production of greenhouse gases—mainly from the burning of gas, oil, and coal—is projected to boost Southwest temperatures about 0.7 degrees Fahrenheit a decade on average throughout this century. That rise brings a host of predictable changes, such as a reduction in snow cover and an increase in heat waves, as well as the potential for troublesome climate surprises. A carbon offset investment, which varies by individual habits, allows people to virtually erase their greenhouse gas emissions, supporters say. Critics charge that the international carbon trading system and the U.S. adaptation of it create illusions about what needs to be done to reign in global warming. The Cool It! campaign lets people offset their carbon emissions by supporting a 66-megawatt wind farm in southern California. The campaign gives people Renewable Energy Credit certificates (RECs), also known as green tags,for the energy produced when their money brings the generated wind energy down to market value, explained Julio Magalhães of the Sierra Club, one of the groups involved in the campaign. “You’re actually paying only this tiny cost difference, which is the difference between the price of coal versus wind,” he said. A penny or two per kilowatt-hour can thus go a long way, explaining why the cost is relatively low. “For the price of a café latte per week, you can offset your carbon emissions,” he added. The contributions are also tax-deductible. In another effort to cut emissions, NativeEnergy, a majority tribally-owned company, uses contributions to support renewable energy, said Robert Gough, of the Intertribal Council on Utility Policy. The carbon offsets in this case count as green tags. NativeEnergy’s efforts support the construction of new tribally-owned renewable energy projects that might not be built otherwise, Gough said. “That money is there to finance renewable energy projects. The finance piece NativeEnergy brings is a significant factor in getting that project built,” Gough said. For instance, offsets purchased by NativeEnergy covered about 25 percent of the hardware cost of a 750-kilowatt wind turbine on the Rosebud Sioux Reservation in South Dakota. Now the Rosebud Sioux Tribe is working out the final details of a 30-megawatt wind farm, also with support from selling green tags, he said. Offset projects often sell credits based on the expected life span of the project. Putting up a windmill involves taking out a loan that requires operators to maintain the system for its expected life span, typically 25 years, Gough noted. Many southwestern utilities allow their clients to support renewable energy by adding a surcharge to their bill, which in some cases is applied toward the purchase of solar energy from other customers. The U.S. Environmental Protection Agency (EPA) lists the utilities that provide this option on its Green Power website (see links on page 5). But not everyone supports the concept of carbon offsets. At this stage, no national accounting system guarantees a carbon offset credit is sold only once or that it delivers what it promises, said Tom Goldtooth, the executive director of Indigenous Environmental Network and coauthor of the 2006 book Carbon Trading. “The elders said if there is something you can’t translate, beware. How can you translate trading hot air?” he asked rhetorically during a December Tribal Lands Climate Conference held in Yuma, Arizona. Goldtooth directed his harshest criticism toward the international carbon trading market. “One of the concerns is that it provides no incentives for clean energy,” he said. Tree-planting projects can allow companies to gain carbon offset credits for planting monocultural plantations, including some that displace indigenous communities as well as native species, Goldtooth said. Also, there’s no guarantee that forests will survive the length of some credits. Just as some groups will sell credits for the expected life span of a windmill, others will tally forestry credits by assuming each tree will survive for several decades. Yet if a forest goes up in flames, some of the carbon that was presumed offset goes up in smoke. Development could also take down some tallied trees. Neither the Cool It! campaign nor NativeEnergy includes carbon offset projects that involve tree-planting. Global warming adds another challenge to the fate of some forests. Temperatures—and therefore evaporation rates—are rising. Changes in precipitation patterns remain mostly unpredictable, although the Intergovernmental Panel on Climate Change (IPCC) summary released February 2 projects that dry regions in general could get drier. Trees need relatively high moisture levels to survive, so lengthy droughts or shifts in wind and rain patterns could convert some forests into grasslands and deserts. Plants and the ocean currently absorb about half the carbon dioxide emitted by fossil fuels globally. These natural systems also absorb the carbon dioxide released by worldwide deforestation. So plants, especially trees, can help curb global warming. Plants build their tissues from water and carbon dioxide. Using energy from sunlight, they transform these raw materials into carbohydrates that they use to survive and grow. continued on page 5 New Mexico forests capture about 21 million metric tons of carbon dioxide a year, while Arizona forests absorb an estimated 7 million, according to the respective states’ Climate Change Advisory Group reports featured in last month’s Southwest Climate Outlook article. But when they burn, forests release some of that carbon dioxide. Arizona’s forests, for example, released the equivalent of about 2.7 million metric tons of carbon dioxide during wildfires in 2002. (This value comes by applying IPCC and EPA conversion factors to emissions data collected by the Western Regional Air Partnership.) The estimate for how much carbon dioxide Arizona’s forests absorb each year took wildfires into consideration, including the 2002 Rodeo-Chediski forest fire that burned 468,000 acres in the White Mountains. Forest management practices can reduce the risk that a wildfire will reach into the treetops, which releases more carbon and kills more trees than a surface fire. Thinning out some of the trees can reduce the odds that a surface fire will explode into crown fires in southwestern forests, according to a study led by B.A. Strom of Northern Arizona University assessing damage from the Rodeo-Chediski fire. The wood from trees thinned out of forests can heat homes, schools, and businesses or provide electricity when burned. Forest Energy Corporation converts the thinned trees from White Mountain forests into pellets that burn cleanenough to use even on smog-alert days, explained Robert Davis, president of the Show Low, Arizona-based company. Burning plant products has less impact on modern greenhouse gas levels than burning fossil fuels because of the time frames involved. The carbon from fossil fuels was captured millions of years ago, while the carbon from plants came from modern times. As long as the forest or farm that provided the plant products remains in place, new plants can start sequestering carbon all over again. In the context of managing greenhouse gases, carbon sequestration includes protecting forests and reforestation projects. Carbon sequestration also involves pulling carbon dioxide out of industrial emissions before they leave the smokestack and placing them into long-term storage. Many policy analysts consider the sequestration of smokestack carbon essential, as the world’s two biggest producers of greenhouse gases—the U.S. and China—both have centuries’ worth of coal reserves to power electrical plants and industry. Coal emits almost twice as much carbon dioxide as natural gas to supply an equal amount of energy. At this point, it’s expensive to sequester carbon, so few companies will embrace the practice without government incentives or mandates. So far this method has been restricted to small demonstration projects, but that could change in the near future. The U.S. Department of Energy plans to build a power plant that will gasify coal and capture all the plant’s emissions for storage, while British Petroleum and General Electric are working together on a California power plant that will sequester carbon for long-term storage (Science, February 9). When the carbon is tallied at the end of the day, individual acts to conserve energy count. Fortunately, saving energy often means saving money. Among the largest contributors to greenhouse gases in the United States are vehicles. U.S. vehicles generate about half of the world’s greenhouse gas emissions, according to a 2006 report by the Environmental Defense Fund. Driving smaller cars or hybrids, walking or biking, living closer to work, keeping tires full, or even lumping errands together for more efficient trips can help save gas, which translates into fewer emissions. In the Southwest, heating water with the sun alone can work with a passive solar system. In summer, even conventional water heaters can be turned off if they’re located in the outdoor sun. Washing clothes in cold water and installing low-flow shower heads and water-saving toilets all contribute to valuable savings. Turning down the thermostat in the winter and turning it up in summer generates savings. Similarly, choosing a swamp cooler over an air-conditioner is more energy-friendly and economical. Landscaping also cools the local environment via the water evaporated through plant leaves. Taller species can provide shade, perhaps even reducing home cooling costs. By using a permaculture approach, homeowners can conserve energy without increasing their water bills. (Southwest Climate Outlook, September 2006). Using compact fluorescent light bulbs and turning off lights that aren’t in use can cut down on energy use. Unplugging appliances contributes because most electronic devices continue to draw energy even when shut down. Recycling, buying fewer products, and using second-hand products also reduce energy consumption because of the emissions generated in the manufacturing industry. In short, there is no replacement for individual action to conserve energy andreduce greenhouse gas emissions. Emissions add up household by household, car by car—and energy savings will too. With creative innovations for sequestering carbon, a willingness to support renewable energy, recognition of the value of plants, and many small efforts by individuals, this country can begin to reign in global warming. The time to act is now, before our climate changes into something unrecognizable that will make even seasoned southwesterners wonder how to handle the heat.